I know, I know… You might be thinking that floral dresses were created for spring and summer, but florals are actually one of the biggest fashion trends this winter. You guys know I’m a pattern lover, so I had to work out a new way to style a floral dress this winter and show you guys that it can be done. While I’m a huge lover of pretty pastels, plaid, faux-fur and suede in colder months, I wanted the challenge of styling a floral dress in the middle of January. 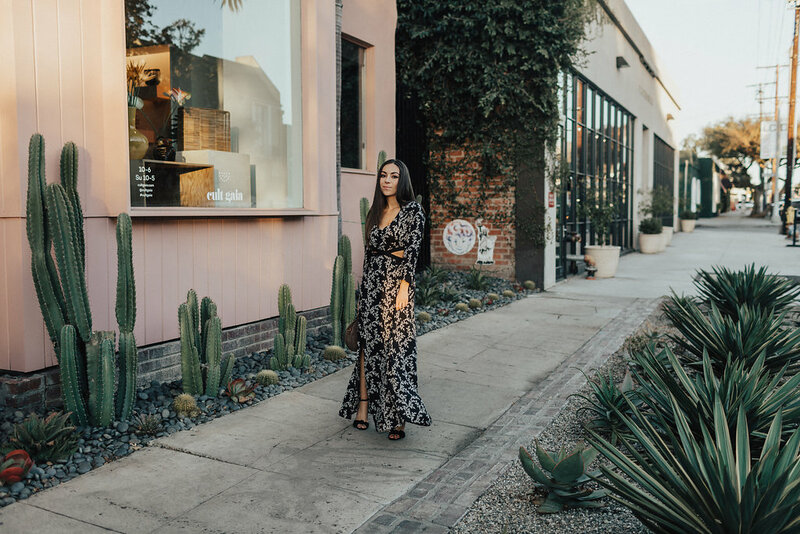 I’m well aware that I live in California, and those of you who live in colder climates might not relate to this, but trust me, it’s possible to wear a dress like this one in any climate! Even in Iceland 🙂 As long as the dress has long sleeves and a maxi skirt-line, you’re on the way to staying warm! Since this dress has cutouts on the sides, you can wear a tank top, a long-sleeved thermal top or a turtleneck underneath. You can even layer it with a thick chunky knit sweater or a cardigan. Feel free to wear leggings or tights if it gets really cold where you live. Finish your look with boots and a plain colored coat that will keep you warm – cashmere, faux-fur, or a puffer coat – and you’re good to go!